Elana Meyer has held world records at 15 kilometres and the half marathon, and boasted five of the 15 best half-marathon times in history, a consistency unmatched by anyone else. Elana Meyer was among the world’s elite athletes for over 10 years, competing when she was younger at middle distances from 1 500 to 5 000 metres, and moving on to longer distances as she grew older. At home, Meyer dominated South African athletics, winning over 20 South African titles on the track, in the half-marathon, 15 kilometres, cross-country and marathon. On the international stage she outlasted many of her former rivals. She held world records at 15 kilometres and the half marathon, and boasted five of the 15 best half-marathon times in history, a consistency unmatched by anyone else. The defining moment of Meyer’s career, however, came way back in 1992. Competing in the Barcelona Olympics, South Africa’s first Games since 1960, Meyer was the country’s best hope for a gold medal. It seemed the entire nation was glued to their television sets as the athletes set off in the 10 000 metres, a race that would take over 30 minutes to complete. It quickly became clear that it would be won by one of two athletes, Ethiopia’s Derartu Tulu or Meyer. Eventually, with one lap remaining, Tulu tore around the track to record a final lap of 64 seconds and claim the gold. However, the abiding memory of the event was created when Tulu and Meyer embraced, draped their national flags around their shoulders, and ran around the track together to massive applause from the crowd. Tulu’s victory was the first by a black female African athlete at the Olympics, and the shared joy of the Ethiopian and Meyer, black and white united, was a victory for a South African nation that was rapidly coming together and heading for its first democratic election. Showing her versatility, Meyer returned to winning form in the same year and the following year with African titles in the 1 500 metres. 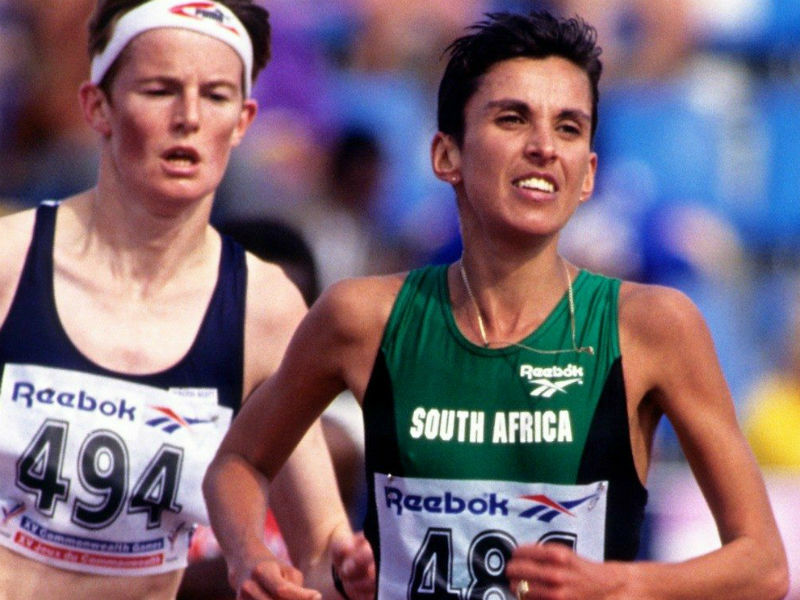 In 1993 and 1994 she again showed how adaptable she could be when she finished sixth in the World Cross Country Championships. On the track at the Commonwealth Games in Victoria, Meyer competed in the 10 000 metres, but was beaten into second place as Scotland’s Yvonne Murray ran the race of her life to claim the title. Moving on to the longer distances, Meyer finished third in the prestigious Boston Marathon, a race first held in 1897. There were two big highlights for Meyer in 1994, however. She was crowned World Half Marathon champion after covering the 21.1 kilometre distance in 1:08:36, and at the World Cup in London she ran a stunning race to clinch an emphatic victory in the 10 000 metres. In 1995 Meyer finished second in the Boston Marathon, moving up one place from her finish the previous year. She also ended fifth in the 10 000 metres at the World Track and Field Championships. In 1996 she finished sixth in the World Cross Country Championships. The following year Meyer claimed another runner-up finish in the Boston Marathon and took fifth place at the Tokyo International Women’s Marathon. In 1998 she shifted her focus to the world’s largest marathon in Chicago, and ended third. 1999 proved to be a successful year for the South African star. She finished third again in the Chicago Marathon, running just three seconds faster than the previous year. At the London Marathon she finished fifth, while she showed her liking for Japan with a victory in the Tokyo Half Marathon. Another good year followed in 2000 as Meyer competed successfully all over the world. In North America she finished fourth in the Chicago Marathon and tenth in the Boston Marathon. In Australia she took eighth place in the 10 000 metres at the Sydney Olympics. In Asia she defended her title in the Tokyo Half Marathon and finished second in the Sapporo Half Marathon. In Africa, she was again crowned South African champion over 10 000 metres. If anyone thought Meyer was slowing down, her performances in 2001 proved otherwise. She claimed race victories in the Cherry Blossom 10-mile, Lilac Bloomsdat 12 kilometre, Miyazaki Ladies Half Marathon and Sendai Half Marathon. 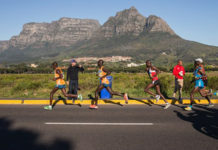 These victories went along with a third place finish in the Peachtree 10 Kilometre Road Race, seventh in the Lisbon Half Marathon and sixth at the World Half Marathon Championships. In 2002, Meyer continued competing internationally, but most of the events she competed in were in South Africa. She placed third in the San Juan World’s Best 10-kilometre race, and was seventh in the Virginia Beach Rock ‘n Roll and South Shields Great North Run half-marathons. Her schedule slowed down in 2003 and 2004 and still included some trips abroad, but after that she stopped competing competitively. A devout Christian, the humble Meyer showed that hard work and determination can carry an athlete a long, long way. Today, she is the Executive Director of the JAG Sports and Education Foundation, responsible for the running of the Foundation and implementing education programs which promote physical health, emotional well-being and personal achievement in underserved communities.